1956 was quite a year for iconic pop-culture. Elvis was singing about his blue suede shoes, Norma Jean officially changed her name to Marilyn, the Yankees won the World Series, Bob Barker stepped out onto his first televised game show set and Grace Kelly married a real-life prince. On the home front, the mid-1950’s kitchen was also going through some equally exciting and interesting design improvements in the convenience department. With more than 35% of women working outside the home by 1956 multi-tasking became “the” trend of new innovations promising both ease of use and the ability to conquer more than one job at a time. 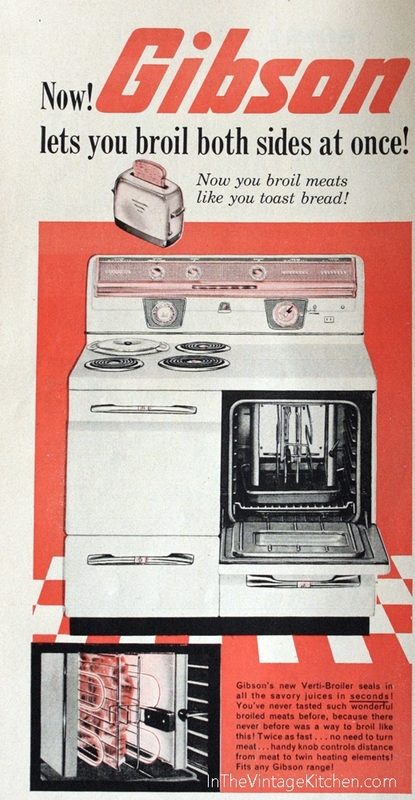 Some of these inventions were a bit quirky (like the oven insert that roasted meat like toast), some paved the way for modern mainstays that we use regularly today (the automatic Redi-Baker) and some (the mobile dishwasher) could totally make a comeback in our modern mini-home craze. Part cutting board, part dishwasher and all on rollers, this totally functional piece of kitchen equipment was meant to be wheeled around from prep counter to table and then back to the sink offering kitchen cleaner-uppers the ability to cut out some extra steps by loading dirty dishes right from the kitchen table. 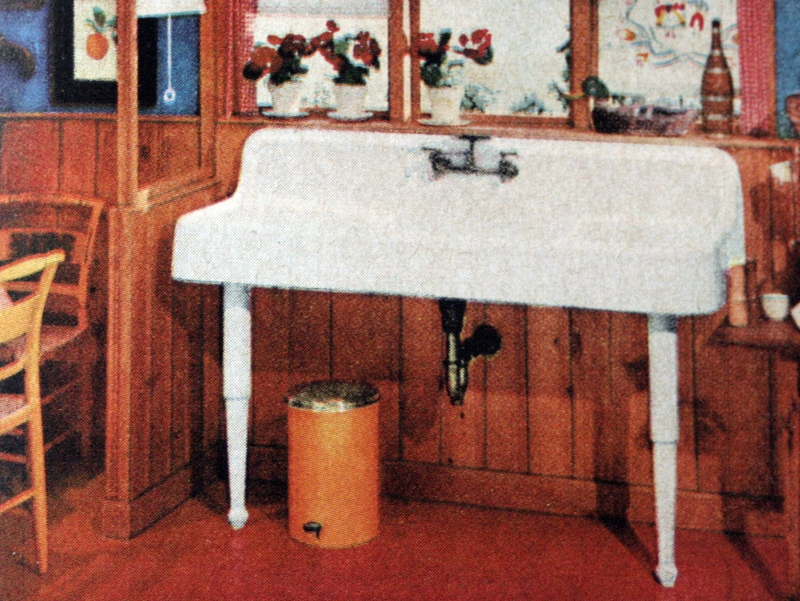 The new mid-1950’s concept of front loading baskets left room for a chopping board on top which was the ideal helper for any kitchen too tight on counter space. 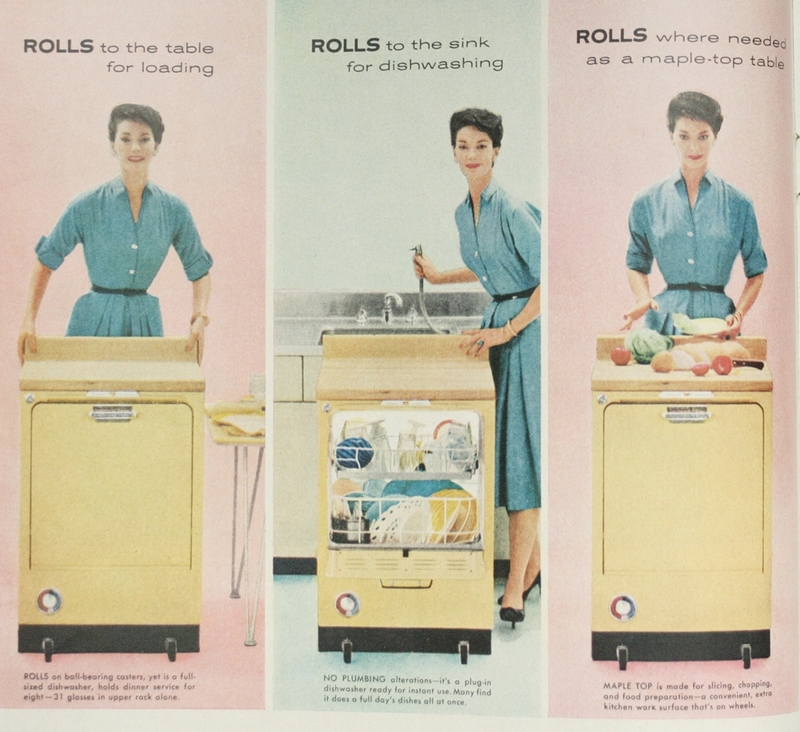 By throwing a cloth over the whole thing this handy appliance could even turn into a rolling hors d’oeuvres cart or impromptu bar area for entertaining, fulfilling three jobs in one – dishwasher, sous chef and butler. Completely functional, this seems like a piece of the vintage past that could definitely come gallivanting back into our world today, especially for city dwellers and tiny house lovers. About the width of a standard contemporary bookcase, the 1956 Shelvador (shelf-in-a-door!) Fresh and Frozen Food Center Twins by Crosley had the ability to hold up to 450 lbs of food and contain fresh and frozen assorted perishables in two completely separate unattached units. One for cold products, one for frozen products. Pitched as the “most convenient food-keeping service ever designed,” owning Shelvador Twins meant less frequent trips to the supermarket thanks to their large storage capacity. It also meant more creative kitchen design. Offering two units for room balance and a series of mix and match colors opened up of bevy of options in the decorating department. Crosley’s were a matter of convenience and creativity. 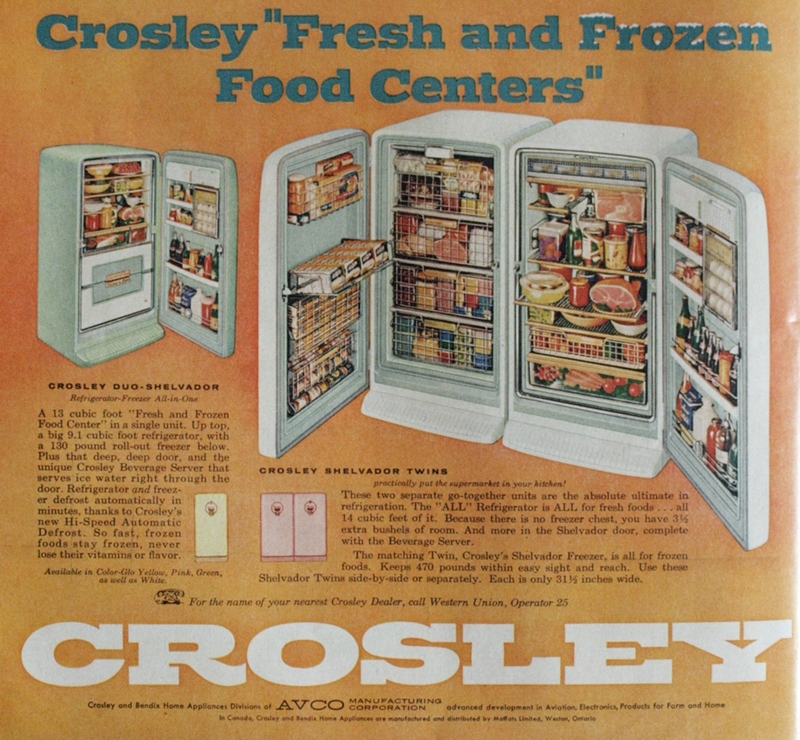 Crosley was the company that first pioneered the idea of installing functional storage compartments in the doors of refrigerators and freezers back in the 1930’s, but their idea was so practical that all the major food storage manufacturers immediately began incorporating the compartment concept into their own designs as well. In order to set everyone apart, individuality came to the design teams of all these manufacturers in the form of unique arrangements within the compartmentalized cold cabinet. 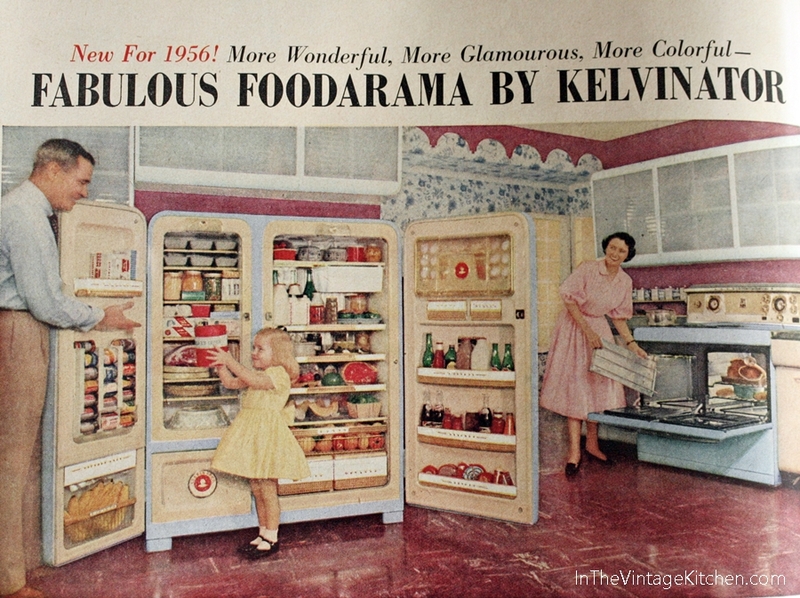 When the 1956 version of the Fabulous Foodarama by Kelvinator was unveiled it was the ultimate organizer’s dream. Offering a bevy of bins, boxes, trays and baskets it was like the Taj-Mahal of efficient food-keeping systems focusing on the nitty gritty details of good design. Bacon, eggs and juice went into the Breakfast Bar section on the upper right side of the door. Waxed papers went into a non-refrigerated dispenser located in the freezer, ice cream got its own gallon-sized compartment specially regulated to keep it at the ideal consistency and bananas flew off the counter and into a room temperature bin just below the freezer papers. Separate spaces for vegetables, cheese, canned fruit and ice cube trays were all designated as well making the Foodarama distinct in its ability to put that there and this here. Gibson, who manufactured air conditioners, refrigerators freezers and electric ranges had a wonderful marketing team (or perhaps it was the design team) that came up with all sorts of colorful names to call the unique details of their stove-tops and ovens. The Thermatic Kookall, the Tel-O-Matic Light Source and the Verti-Broiler are just three examples that dazzled potential range buyers but mostly they were glitzy names for ordinary features that other popular ranges came with too. Until the exclusive Gibson Verti-Brolier was born. Inspired by the close heating elements of the common, everyday toaster the Verti-Broiler turned the meat industry on its side (literally) buy taking the same directional cooking concept as a slice of bread but exchanging it with a slice of beef. With the pronounced ability “to seal in savory juices in seconds” this proposed method was supposed to cut cooking time in half making it a helpful necessity for busy working men and women. In a future post we are going to experiment with this cooking method (steak on the vertical) to see what happens. Stay tuned for more on that this summer. It may seem a bit difficult nowadays to get excited about a paper napkin – but in 1956 they were indeed a source of novelty among meal planners. By giving women a plausible, non-guilty excuse for setting aside their traditional cloth napkins, these paper cousins eliminated the need for excess laundering and large linen closets. 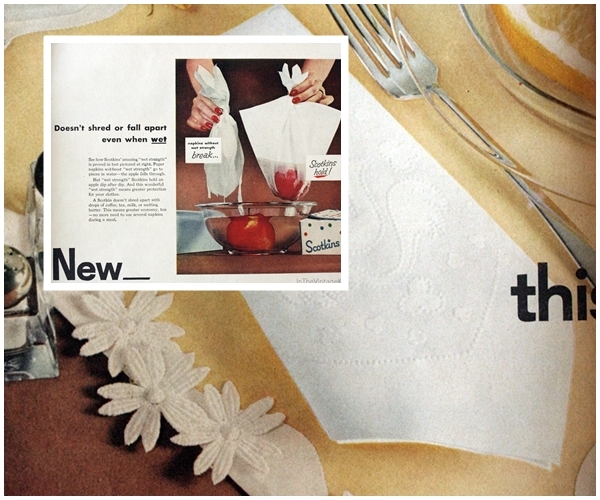 Thanks to the 1956 invention of the Scotkin – Scott Paper Company’s introduction of the super strong and absorbent 2-ply paper napkin, these elegant yet disposable damask designed napkins boosted all the beauty of linen without all the upkeep. No more washing, starching, and ironing needed with a Scotkin – just use and toss out. They were available in two sizes – dinner and family and were destined to become an ever-useful staple paving the way for similar products still on the market today. 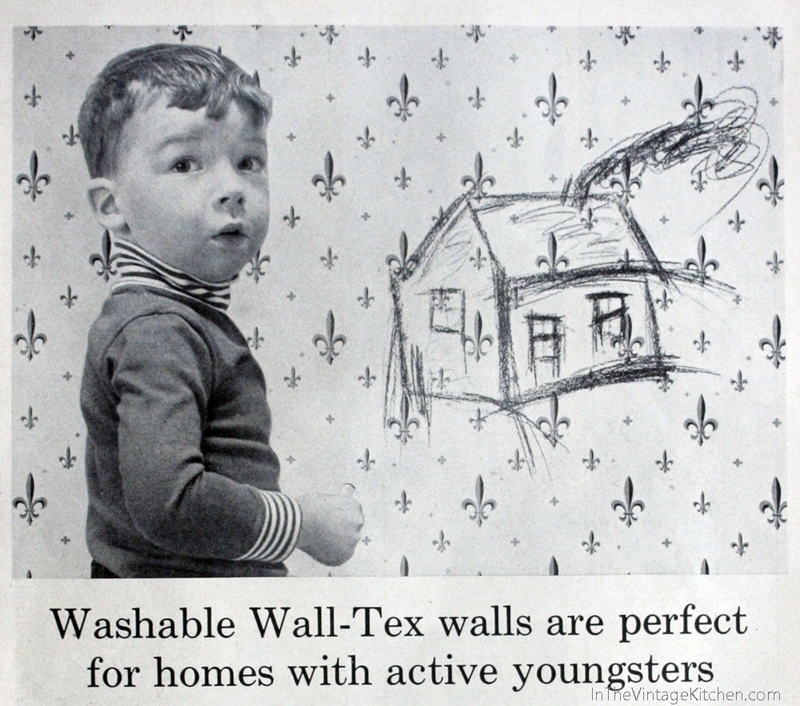 The Columbus Coated Fabrics Corporation began introducing washable wall canvases in the early 1950’s but by 1956 they were hitting their stride and gaining such popularity that dozens of new designs were being unveiled each year under the Wall-Tex brand. Prized for their easy ability to wipe off grease, dirt and drawings (as seen above!) this durable wallpaper-like covering sped up housecleaning and allowed for a somewhat more relaxed atmosphere when it came to looking after the messy effects of energetic kids, pets and cooks. Hung with paste just like traditional wallpaper, Wall-Tex canvases were baked with a layer of plasti-chrome that produced smooth, easy-to-clean surfaces ideal for kitchens, bathrooms and play areas. Columbus Coated Fabrics Corporation and the Wall-Tex brand went out of business in 2001 but recently peel and stick wallpaper has come back into fashion again so perhaps we will head down the highway of washable wall canvases yet again. 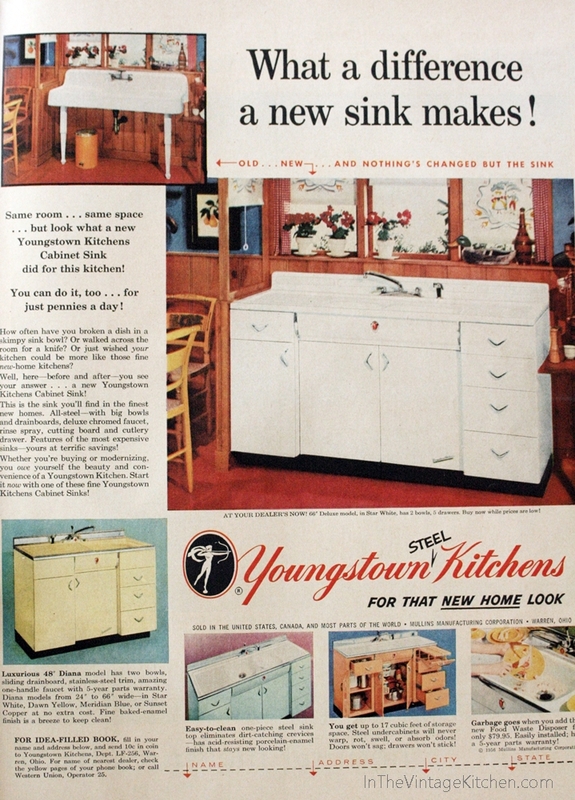 Popular Youngstown brand (the leader in mid-century cabinetry) hid the plumbing, added sleek steel drainboards, a garbage disposal and pull out drawers and shelving. 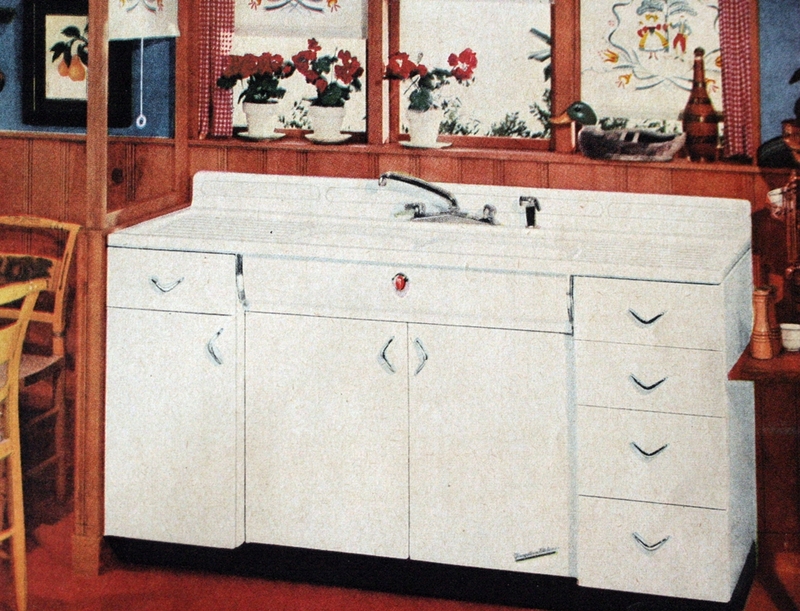 Deluxe models even included two sinks, pull out cutting boards and a cutlery drawer transforming the ordinary sink into an extraordinary piece of furniture. 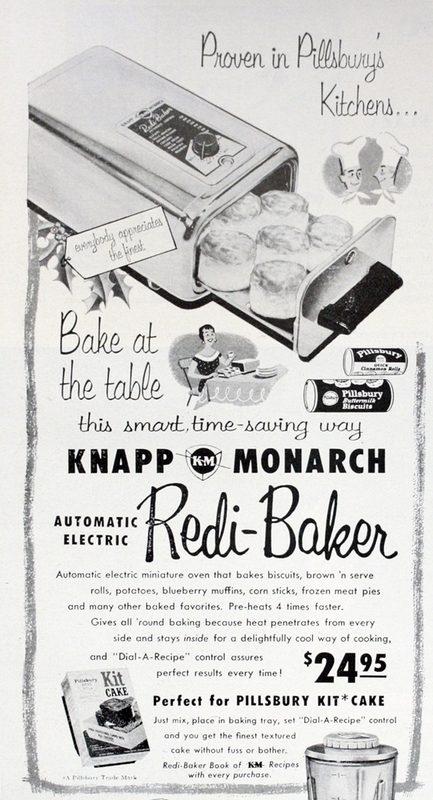 A pre-cursor to our counter-top toaster ovens, the Knapp-Monarch Automatic Electric Redi-Baker was the mini oven you needed to bake small portions right at the kitchen table. As a cost-saving device you no longer needed to heat up the big main kitchen oven in order to enjoy single serving items like breakfast sausages or biscuits, and as a convenience measure you could tote it anywhere around the house as long as you had an available electric outlet. This essentially took baking out of the kitchen and into other rooms of your choosing or even to the patio. While a great idea at the time, the Redi-Baker was in competition with a lot of other emerging small appliances eventually becoming overshadowed by bigger, more well known brands. It was out of the market altogether within the decade. In the traditional place of four burners on a stove-top Frigidaire Electric Ranges introduced a new concept in cooking equipment with their 1956 unveiling of the Imperial Range… a built in Thermizer. 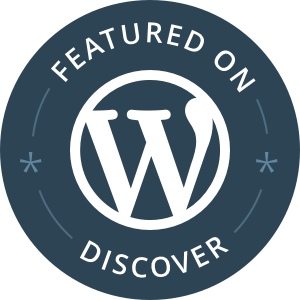 Essentially it was like a big pot sunk into the stove that could be used to boil, roast, fry or slow-cook an assorted number of dishes from soups and sauces to pot roast, dumplings, desserts, and even popcorn. With a removable 6 quart pot that fit inside the well of the Thermizer you could even use it to sterilize canning jars, steam vegetables and bake small pies or individual sized desserts. A true novelty in the productivity department, it helped cut down on the expense of heating large ovens for small projects while also giving home cooks the ability to prepare and pre-plan large meals effortlessly. Italian designer Mossimo Vignelli (1931-2014) believed that good design was a language not a style. It is easy to forget that all the bells and whistles on what we consider to be normal kitchen equipment (fridge, freezer, stove, dishwasher, sink, cabinets, etc.) first started out as novelties and innovations. They were all experiments destined to stick or stink. 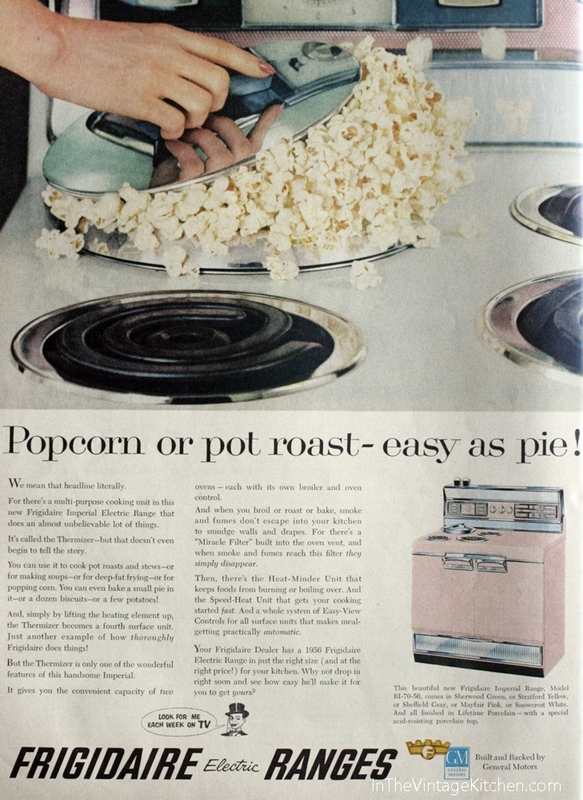 We’ve come a long way from the caveman days of cooking over open fires in the wild but in the 61 years that have passed between 1956 and today it is interesting to note that we are still requiring the the same sets of demands from our ideal kitchens – time saving shortcuts, multi-tasking equipment and maximum storage. We are still a society juggling time. We are still a society talking about the most effective ways to produce a product and fulfill a specific need. And ultimately we are still trying to sort out our most efficient eating and cooking habits. Mossimo is right. The good bones of functional kitchen design began to form fifty years ago but the conversation isn’t over yet and the language is still being translated. Everyday ahead gets us one smidge closer to improving the landscape we learned about yesterday. 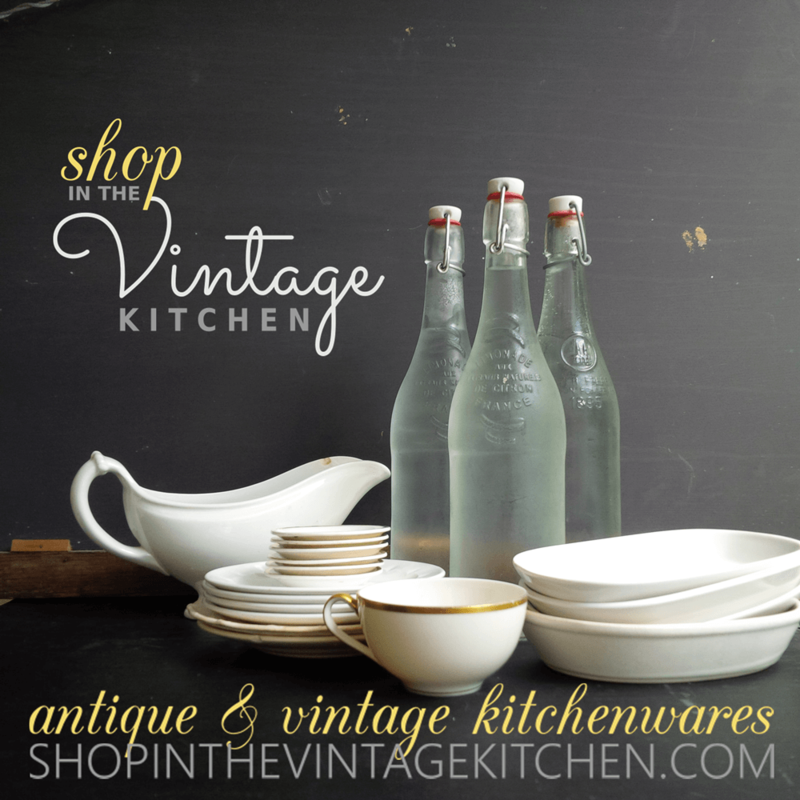 Would you like to see any of these vintage kitchen trends embrace our modern spaces today? If so, post a comment below! In the meantime, cheers to past designers who made their marks and to future innovators who sustain them! Previous Celebrations Big and Small and Lucky! 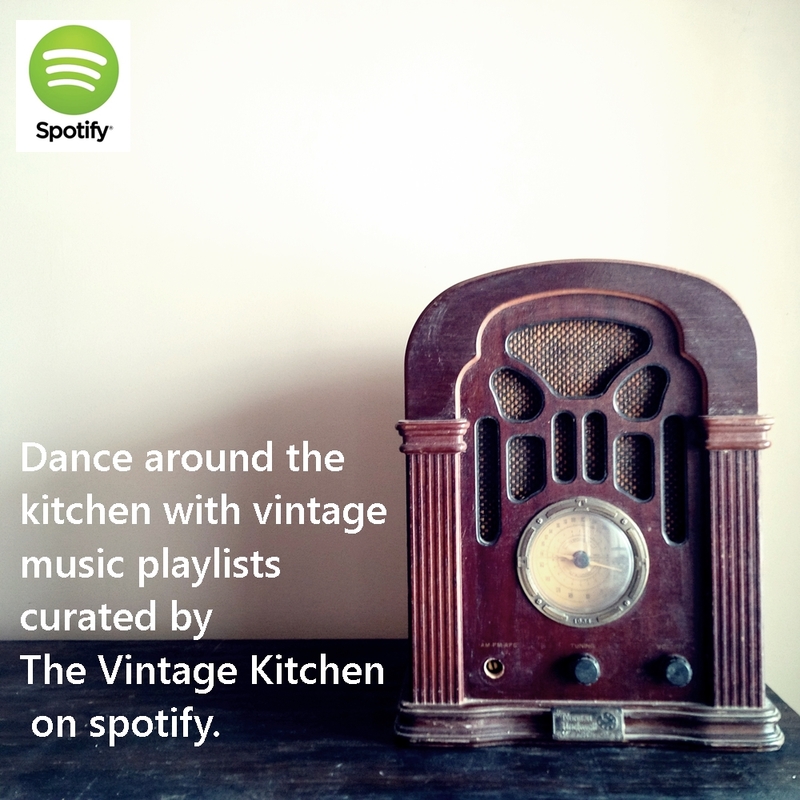 Next Sunny Side Up: Your Peppy Vintage Music Playlist is Here! Hello! How exciting to own a working Red-Baker. They were made by Knapp-Monarch during the mid-1950’s to the mid-1960’s. Definitely a fun relic and a vintage kitchen novelty!